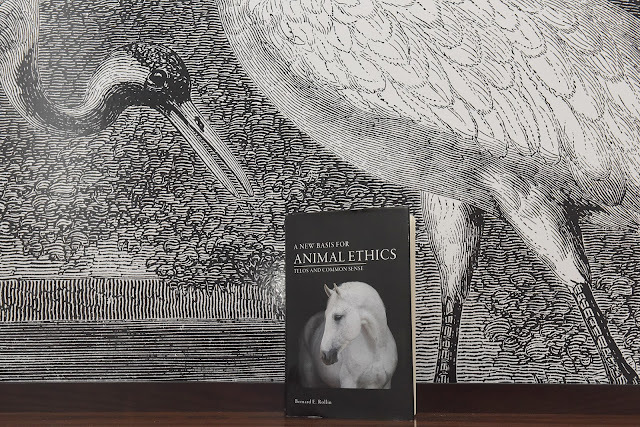 Bernard Rollin's newest book, A New Basis for Animal Ethics: Telos and Common Sense, set against a fantastic feature wall (alas, not mine). When one considers the staggering amount of unnecessary suffering experienced by animals in all the multifarious uses we impose upon them, it is virtually impossible to remain unmoved” – Bernard Rollin, 2016. There is no question that our society is predicated on animal use which is almost impossible to escape. The food we eat, the clothing we wear, the medications we rely on, are based to a large extent on animals. For philosopher and ethicist Bernard Rollin, the problem is not with animal use per se but the suffering that this causes in various contexts. He's not the only person to raise concerns about the use of animals. Others like Peter Singer have argued that we have a moral duty to minimise (or eliminate, where possible) suffering. This reflects a utilitarian approach – seeking to maximise good, or pleasure, and minimise pain. Then there are people like Tom Regan who take a rights-based approach, arguing that we should respect the rights of animals just as we have learned to respect the rights of other groups in society, for example women. Many ethicists get caught up in a debate about whether there are morally relevant differences between people and animals, which may or may not “compel us to withhold the full range of our moral machinery from animals,” Rollin writes in his latest book, A New Basis for Animal Ethics: Telos and Common Sense. What we need to pay attention to, he argues, is the telos or nature of animals. According to Rollin, then, animals have needs and desires which flow from their natures or teloi, which – when thwarted, frustrated or unmet – lead to negative feelings or the experience of poor welfare. Acceptable systems of animal use, Rollin argues, must accommodate the telos of the animals involved. In other words, to have a life worth living, animals must be able to express the full suite of natural behaviours. Rollin’s arguments are compelling and his examples – drawn from decades working with veterinarians and others trying to improve the lot of animals in contexts ranging from laboratory animal medicine to agriculture – are fascinating. My interpretation is that Rollin calls for a return to more extensive, traditional husbandry systems (as opposed to intensive agriculture) and – where the benefits of experimentation are shown to outweigh the costs – laboratory animal housing that accommodates the specific needs of species and individuals involved. He doesn’t really discuss companion animals, but he does talk about domestication. He argues that domestication and in fact genetic engineering do not violate telos, because it is not the nature of animals that is sacred and inviolable – rather the interests flowing from it. As he writes, “It is a better world in which husbandry and sustainability reign over productivity and profit at all costs. The animals live decent, natural lives. Animal welfare is integral to the system, not an afterthought to be politically imposed” (p128). Though he concedes this will be challenging, Rollin argues we don’t have much choice. “…we must consider that industrial agriculture is very likely living on borrowed time, not being inherently sustainable. If, for example, we lose cheap energy, the whole system collapses” (p129). Rollin’s approach relies on us to observe, recognise, respect and protect the interests of animals. If we are going to use animals for our own ends, he argues, we must ensure they have a “good” life. 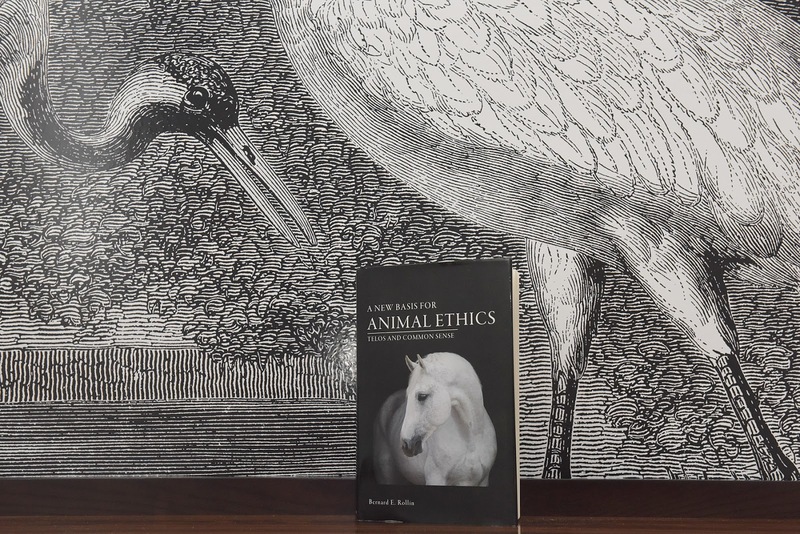 This book provides a good overview of Rollin’s work, a fascinating history of animal welfare science and the animal rights movement, and a good discussion of some of the limitations of traditional ethical approaches. Like all philosophy books, it raises many questions, including how we legislate protection of telos. Definitely a must-read for those who are interested in the ethics of animal use. Rollin BE (2016) A New Basis for Animal Ethics: Telos and Common Sense. University of Missouri Press, Columbia.